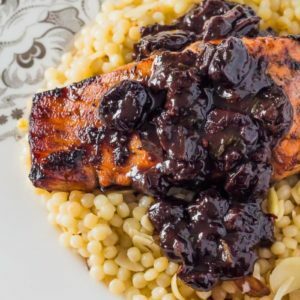 Chipotle Cherry Sauce is the perfect recipe for broiled salmon. Create a special dinner with this sweet and tart sauce with “heat notes” from the chipotle. Marinate your salmon, chicken, duck, game or pork, and use as a glaze for a final layer of intensity. Made with our Spiced Sour Cherry Spread. 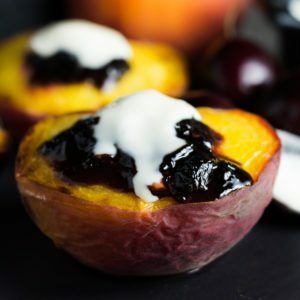 The Cherry Vinaigrette Dressing is fruity with small pieces of Sour Cherry and combined Pumpkin Honey Mustard, Garlic cottonseed oil help to create the perfect balance between sweetness and acidity. 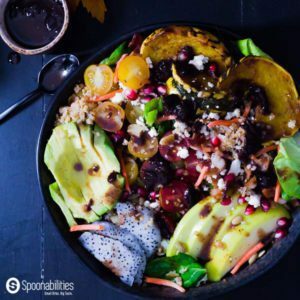 Great salad dressing for a salad with seasonal produce from the Autumn season. 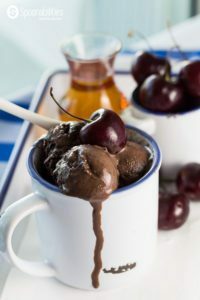 Semi-homemade Spiced Sour Cherry Chocolate Ice Cream is one of the easiest 1-2-3 recipes at Spoonabilities. You just need to get a pint (or more) at the supermarket, let it soften, add the Spiced Sour Cherry Spread, refreeze and voila! ..or for more authentic, homemade, from scratch ice cream, we have a recipe for that too.